Sara (Desiree Akhavan) is a documentary filmmaker whose web show, Encounters, aims to look at the stories behind the strange world of online personal ads. However, fearing failure and desperate for views, she finds she finds herself in the remote house of self-professed serial killer, Aaron (Mark Duplass). Aaron is having a hard time. Ever since turning 40, he has lost his inspiration and he has no joy in his life. His solution is to make a documentary in the hope that, together, he and Sara will make magic. 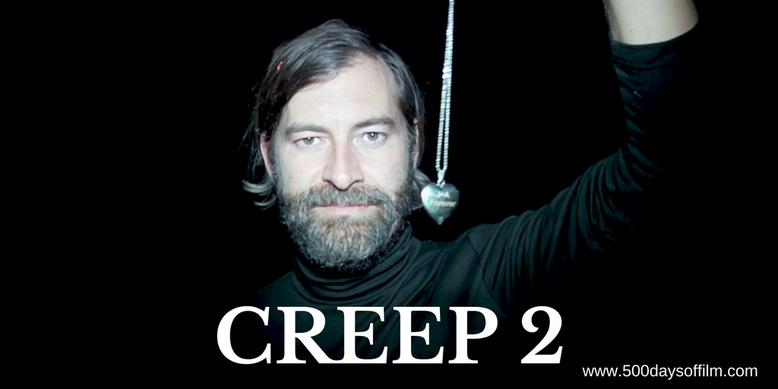 I have to admit that I began watching 2014’s Creep with a heavy heart. By then I had had more than enough of found footage movies. However, here was a horror premise with a difference - a story with an actual, understandable reason for the constant filming. Spirits lifted, I thoroughly enjoyed Patrick Brice’s film. Shot on an impressively low budget, Creep is gripping, tense and uncomfortable. The film also features a superbly disturbing (and, yes, creepy) performance from co-writer, Mark Duplass. Was I left craving a sequel? Well, not exactly. However, Creep 2 (which also uses a ‘video footage’ device) is just as unsettling and entertaining as the original and I am glad that it exists. After all, Duplass’s character (here called Aaron) is too good a horror creation for just one film. This brings me to a key point. Is Creep 2 a horror film? Well, it certainly isn’t afraid to get nasty. In addition, it enjoys playing with horror movie clichés (including more than a few jump scares). However, Creep 2 is not a frightening film - this is not your typical horror fare. Instead, co-writers Duplass and Brice set out to subvert our genre expectations. Traditional horror tropes are called out and dismissed in many entertaining and enjoyable ways. Nothing happens and no one behaves in the way that we expect. We know from Creep that Aaron is inherently strange - fascinating and disquieting in equal measure. What does he want and why is he the way he is? However, even Aaron gets more than he bargained for with Sara. And this is where Creep 2 comes into its own. Superbly portrayed by Desiree Akhavan, Sara is a compelling character in her own right and about as far from a female horror stereotype as you can get. In a series of highly comedic scenes, Aaron tries to unsettle and scare Sara. He fails - describing her as “a tough nut to crack”. Sara’s eccentric resilience (born from a desperate desire for professional and creative success) is a revelation to him and the two find more in common than either anticipated. However, we know more than Sara and we know that she is in over her head. Sara is in real danger and, because we like her so much, we fear for her - moving towards the edge of our seats in the uncomfortable knowledge that anything could happen. Have you seen Creep 2? If you have, what did you think of this film? Let me know in the comments section below or over on Facebook or Twitter (@500DaysOfFilm). Sara is prtrayed by Desiree Akhavan, NOT Karan Soni. Did you even watch the movie?